Due to cancellation December 6th to 18th 2019 now available at a reduced rate. Situated on the much favoured southern side of the Jolly Harbour Marina residential community, this spacious and fully air-conditioned villa is a 5 minute stroll to a beautiful white sandy beach with beach bars and sporting facilities. wi-fi ( subject to technical availability) and recently updated, and fully refurbished first floor with Italian tiled floors, new ensuite shower rooms and balcony to master bedroom. Modern furnishings throughout. Direct access via patio doors from ground floor, open plan, living area to newly tiled and furnished deck. Beautiful views and afternoon sunshine. The view from the deck of 'Sleeping Indian Mountain' is my favourite! Bed sheets and bath towels provided together with a regular housekeeping service. Beach towels available from our management company at check in. All facilities within the complex are easily accessible within a few minutes walk (although golf carts are available for rental). These include a large well stocked supermarket (with Waitrose products! ), a good variety of restaurants and bars, banks, car and boat hire agents, gift shops etc, tennis courts, communal pool, gym and fitness suite and an 18 hole Golf Course and clubhouse. Open air cinema available on most Saturdays. Independent taxi drivers operate from the Commercial Centre and the bus stops at the end of the drive. The supermarket is open 7 days a week until at least 8.00pm and the bakery is well stocked each day. Yacht charters, catamaran cruises and buggy, car and bicycle hire are all available to book at or through outlets in the centre. Excursions to neighbouring islands are available. 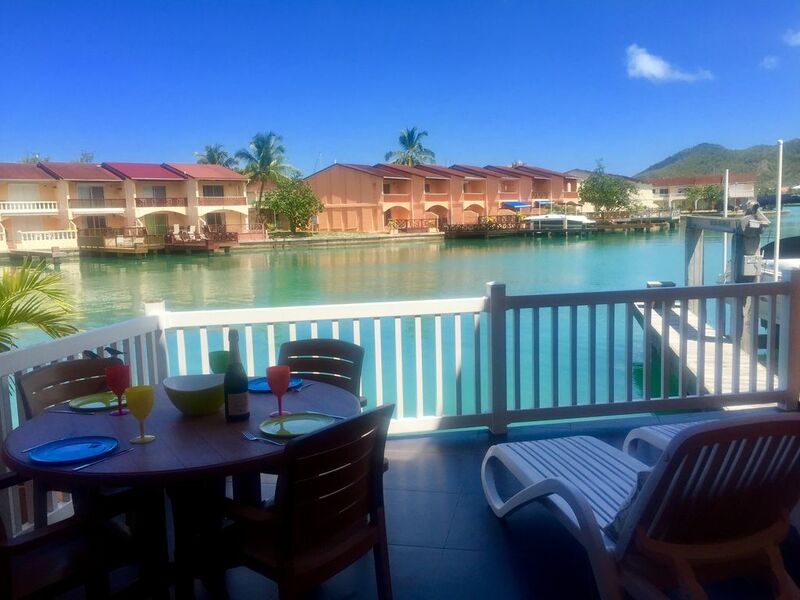 The Jolly Harbour complex houses many independently owned bars/restaurants ( please note that some restaurants may be closed or operate reduced hours during low season). The Villa is primarily our holiday home, and we have enjoyed family holidays here for over twelve years. The property is equipped as a base for an enjoyable and relaxing beach or activity holiday. We are Mark and Teresa Ayre from the UK. Our villa is primarily our own holiday home, comfortably furnished and equipped for our family's needs. The property is regularly maintained and most recently the first floor has been fully renovated to reflect both our needs as a family and for the comfort of our guests. Both bedrooms now have beautifully tiled, modern, ensuite shower rooms and and the entire flooring has been replaced with matching Italian tiling. Over the last two years we have installed a beautiful ceramic tiled deck and have invested in up to date air conditioning throughout the villa. New sofas and deck furniture were added last year. Ever aware of our guests needs, we have recently had our own WiFi connection installed, so guests will no longer have to rely on the hotspot that has previously covered most of the rental villas. Unlimited WiFi is free to all guests subject to technical availability. Due to work/family commitments we are only able to visit the island two or three times a year, so we have decided to offer the villa for holiday rental so that others can enjoy Antigua at a reasonable cost. Our villa is ideally situated for a relaxing holiday. Close to both the beach and shopping centre it is simple to pop back and forth throughout the day, allowing you to split your days between sea , shopping and siesta with ease. Jolly Harbour is a great base to allow you to explore the rest of the island, although with one of the best beaches in Antigua on your doorstep, many guests do not venture far! We take pride in offering a good service to our guests and communicate regularly with you in the run up to your holiday. The combination of fully involved owners and the professionalism of the HomeAway /Expedia holiday platform, offers our guests the best of both worlds. A personalised holiday experience with the security of booking through an internationally known organisation. As we live in the UK it is really important to have a trusted Antiguan management company available to you throughout your stay in the Island. James Richards, his wife Roxann and their team of Housekeeping and Maintenance staff have been looking after our guests for well over ten years. Free WiFi and Air Con throughout A light and bright, modern and comfortable villa to either use as a base or for a fully self catering holiday. Newly tiled deck and new upper balcony (to Master suite) overlooking the bay and 'Sleeping Indian Mountain'. New ensuite bathrooms with walk in showers and modern fittings. Travertine tiling to both Master and Twin bedrooms. Fully equipped kitchenette with large fridge freezer and microwave. New inverter air con units to all main living areas (living room and both bedrooms). Fully engaged owners who take the responsibility of renting our holiday home very seriously. Property owned by us for fourteen years. On site management company and housekeeping facilities. Rented successfully through HomeAway for over ten years. In all main rooms. Plus ceiling fans. Unlimited free wi-fi in villa - Ask for password at check in. Two sofas, coffee tables and tv. Direct access to large tiled deck area overlooking water. Cable tv showing local and international channels. In addition to cable tv the is unlimited WiFi available to guests to allow you to stream onto your own devices. Selection of books and magazines. available for guests. Larger library available at the HBK Office with a take one leave one policy in operation. Balcony off Master bedroom, overlooking water. Furnished Deck accessed directly from living area overlooking water and mountains. Various boat hire and charter options available on complex. Communal pool available to guests of villa owners free of charge. All facilities on the complex are available to villa guests (some at an additional charge). Maid service is provided at the beginning and end of a rental period and at least once a week for the duration of a holiday rental. Additional maid service is available through our management company on site. WiFi has recently been installed at the villa and unlimited access is available to guests. Password to be requested at check in ( also printed in welcome folder in villa). Internet access is also available on the complex from a variety of 'hotspots' and restaurants/cafes for the price of a drink. The community of Jolly Harbour has barrier controlled access and 24 hour security. Please appreciate that we have no control over the facilities provided within Jolly Harbour, the Marina or the Commercial Centre and whilst we try to keep all the above information up to date, we cannot be responsible should anything change. Wonderful stay in a beautiful waterfront villa! My family and I just returned from a 2 week holiday in Antigua. We visit Antigua yearly and always stay in Jolly Harbour as we love the convenience of amenities on site. This trip we stayed in villa 227C. Prior to our arrival I was in contact with the owners, Teresa and Mark, numerous times. They were lovely to deal with, made sure we had all information we needed along with details on Jolly Harbour. They wanted to make sure we were completely ready for our stay. Their villa is beautiful, and you can tell they take pride in this property. All the necessities you need were available, and the villa was fully equipped and spotless! I would definitely stay at their villa again and recommend to anyone travelling to Antigua that would like a fully equipped accommodation, great location, within walking distance to the beach, restaurants, supermarket etc. Thanks again, Teresa and Mark, for allowing us a wonderful stay in your villa! Thank you for your lovely review. I’m so glad that you had a good trip and found the villa to be perfect for your needs. We take great pride in providing a good service to our guests, before, during and after a vacation and we are so pleased when it is appreciated. We do hope that you will be returning to Antigua soon. We were honoured for you to choose our villa to celebrate your 40th Wedding Anniversary. We are so pleased that you had a wonderful time. We recently stayed for a week, the property was ideal for us (a couple with a 7 year old daughter), it was in a great location close to the beach and local amenities and in a beautiful setting overlooking the water. We hired a car so that we could explore the island although everything was on site within a reasonable walking distance and a great holiday can be experienced by staying locally if not wishing to travel too far. The villa was lovely; modern,clean and well maintained and well stocked with everything we needed. The HBK staff that we encountered (Roxann and Titan) were really nice and very helpful throughout our stay. From the moment we booked our stay Teresa was in touch regularly with information and helpful tips, this personal touch was hugely reassuring for us having never booked a villa via an agency before. We have recommended this villa to family and friends and would stay again if we holiday in Antigua in the future. I am so glad that you had a lovely holiday. I will pass your kind comments on to the staff at HBK Villa Management who have been looking after our guests for over thirteen years. I look forward to welcoming you back to our holiday home. Beautiful villa in a perfect location! Our family of 4 (2 adults and 2 young kids) stayed at this villa 227C last week and it was everything we expected it to be and more! The owner Teresa was extremely helpful in answering any questions I had leading up to our stay. This was our 1st time in Antigua and Jolly Harbour was such a perfect spot for our 1st Antiguan experience. It was low season so some shops/restaurants/services were closed but the beaches were all so spectacular and most of the time we enjoyed them all to ourselves. This villa was beautifully simple, clean, comfortable, in a great location and had everything we needed for our week stay. The latest upgrades of the bathrooms and tiled floors were a very nice touch. There was even a blender in the kitchen which was nice to make my smoothies every morning. We rented a golf cart during our stay which was essential in getting around the property with 2 small kids. The South beach was a nice short 5 min walk but the stores/restaurants and North beach were further and that’s when the cart came in handy. Most outlets are European 2 prong except for the one American one we found next to the fridge. We brought 2 universal adapters to charge our devices and found that was enough. There were Air Conditioners in good working condition in each of the bedrooms and in the common area on the main floor. The HBK property management (Roxann, James and Romeo) were always there to answer any questions and prompt with their services which made our stay that much more enjoyable. Cleaners came twice during our stay and refreshed the towels and linens. We enjoyed our meal times sitting on the large newly tiled patio, enjoying the boats passing by and the breathtaking view of the mountains. The food to purchase at the Supermarket is quite expensive so I tried to bring some staples that we love such as cereal, oatmeal, snacks, maple syrup, things that were light to pack. We ate out for 3 dinners around Jolly Harbour, Al Porto – Italian, Amazing 2 for 1 Pizza night Tuesdays, Miracles – Seafood just outside the complex, amazing Curry Goat, and De Underdog – Sports bar food, less expensive option. We loved every minute of our stay and would highly recommend booking this villa. We are looking forward to coming back already! Thank you for your lovely and informative review. It is so kind when guests pass on their recommendations to future holidaymakers. I will pass on your generous comments to Roxann, James and Romeo at HBK Villa Management. I know they will appreciate it. First and foremost thank you so much for allowing us once again. My wife, myself and our new born stayed in at 227C for a week & it was awesome. The staff is super friendly and you can do so much stuff around the villa. There is one outdoor pool, and a bar walking distance. Restaurants . etc. It's very nice! The rooms are big and the bed is very comfortable . I will definitely recommend this place and I will always go to Teressa & Marc. Always nice to have you back! The pool is currently being renovated ready for the new season so should hopefully be up and running again by the end of the year. Antigua with it's all year round warm climate boasts that it has 365 beaches, one for every day of the year! The island offers a wide variety of things to do and see from boat trips and island safaris to visiting the public market and colourful shops at St John's and the historic Nelson's dockyard near English Harbour. Explore the countryside through tropical forests, local villages and deserted sandy bays. Jolly Harbour is not only the largest marina community in the Caribbean it also offers a perfect base from which to explore Antigua. Set in 500 tropical acres, Jolly Harbour has everything you could possibly ask for to enjoy a fabulous holiday in a spectacular location. The Reception and Information Centre is available to guests of the villa to advise and arrange activities outside the resort as well as provide information on the many sporting and leisure opportunities available within the community. Other Activities: Catamaran Cruises.Sailing and Eco Tours. Helicopter tours of island and Monserrat. Please ensure that you have arranged travel insurance to cover both your flights and accommodation, as refunds due to late cancellation are not available. Rental rates include all utilities, air conditioning maid service and support of on site management company. Additional charges for Late Check Out ( if available) and additional bed/cot per night. Please enquire at time of reservation.